The concept of Windows Multipoint Server is easy. It takes the excess power of a computer and shares it across multiple end users. Called "Shared Computing" or sometimes "Virtual Desktops", this is possible due to advances in technology. In the past, Personal Computers (PCs) were designed to be simple and used by individuals. Servers were powerful enough to handle the computing needs of many individuals in an organization, but needed skilled IT professionals to run them. But that's changing. Today’s PCs have become so powerful that they can deliver quality graphics and video and still have excess power to spare. Windows MultiPoint Server 2012 leverages the excess power of a PC and turns it into a server capable of powering multiple computing sessions at once. It’s the software operating system that runs each end user's personalized Windows 8 "session" on the host computer. It then delivers a "virtual desktop" experience via the access devices to each end user working on their own monitor, keyboard and mouse. It's easy to install and manage. Check out the product demo and virtual tour to see how it works, and refer to the image below to learn more about the hardware solutions. The host computer runs the Windows MultiPoint Server software and powers the experience for the teacher and students. WMS requires a 64-bit processor, with sufficient processing power (CPU) and memory capacity to meet the performance demands of the number of simultaneous users and applications used. The system requirements will depend upon the programs and features you decide to install, the number of users and how the system is used. For example a set up with 5 or 6 students using productivity applications like Office 2013 would require less processing power and RAM than a set up with 15-20 stations and heavy multi-media use. To see the recommended hardware click here or refer to the Windows MultiPoint Server 2012 Planning Guide. Access Devices connect the host computer to the individual stations, allowing multiple people to share the same computer while still having their own independent computing experience. Sometimes called "thin clients" or "zero clients", these access devices enable the physical connection, as well as the efficient flow of data and video to multiple monitors. There are three main ways to connect: Direct Connection (with a Video card into the back of the host computer), USB Connection (an access device connected to the host computer via a USB cable) or LAN Connection (end user stations connecting via the network, rather than connecting physically to the host computer). You can mix these methods and arrange the user stations in the best way to suit the space and layout of your classroom. The teacher and students have their own stations, with their own monitor, keyboard and mouse. Teachers orchestrate and monitor the learning experience from their station. Using the MultiPoint Dashboard, they can see thumbnails of student’s desktops, allow certain websites and send messages to individual students or the whole class. Teachers can even use remote control to assist when a student needs help. Students learn efficiently and productively at their own user stations. Students view content and share files whenever they need to, work on and save files in their own private folders or on USB drives, and gain an enhanced learning experience. A single monitor can be used by two students with "split screen" to allow them to collaborate side by side. Some advanced monitors also come with the access devices built right in, to save space and reduce the amount of devices for each workstation. You can also re-use existing monitors, keyboards and mice that you already have. If there are already Windows 7 or Windows 8 PCs in the classroom or lab they can be monitored and orchestrated in the same way as Multipoint stations by installing the MultiPoint Connector. Just setup Windows Multipoint Server 2012 on a central computer in the classroom (or in a VM in the school or district datacenter), then install MultiPoint Connector on each computer in the classroom – desktop, laptop or tablet. 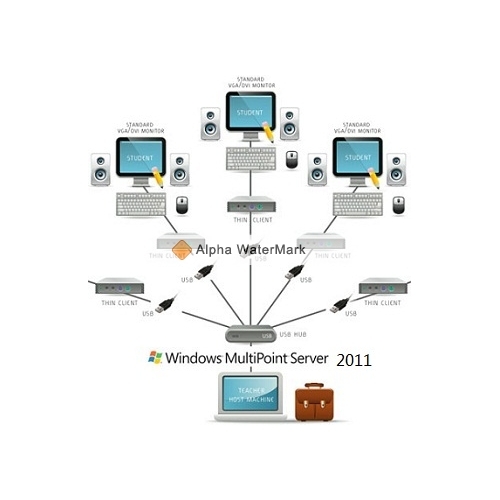 The teacher can then use the MultiPoint Manager to discover those PCs on the network and add them to the MultiPoint Dashboard. This centralizes control over all those computers and the teacher can effectively focus on classroom learning.